Music is all around us throughout each day of our lives, and it is a basic expression of human culture. By giving each Priory student the opportunity to perform, create and listen to music, we give them a new voice in which they can choose to express who they are in a diverse, global society. The Priory School Band mini-concert and vernissage showcased both the band and art programs of Grades 5 and 6 held on Wednesday, April 17. Under the direction of music teacher, Mrs. Campbell, each class performed pieces that incorporated all the concepts and skills learned throughout the year, clearly demonstrating the astounding talent and poise of our band students! Grade 4 students were also invited to try out some of the band instruments on offer and were given insight into the progression of learning in the band program. The highlight of the Grade 5 portion featured Mr. Davey Lahteenmaa as the guest soloist in “Concerto for Triangle”, while the Grade 6 portion concluded with a rousing rendition of the classic “Can-Can”. The audience was delighted with the performance and praised the students for their hard work to develop their skills on their chosen band instrument. Thanks to art teacher, Mme Kuska, parents and guests were invited to view the collection of art work, demonstrating the creativity of our young artists. Inspired by Jazz music, Grade 5 students showcased their Jazz wearable art instruments while the Grade 6 students showcased their unique creative selfies. Ahoy, me Hearties! 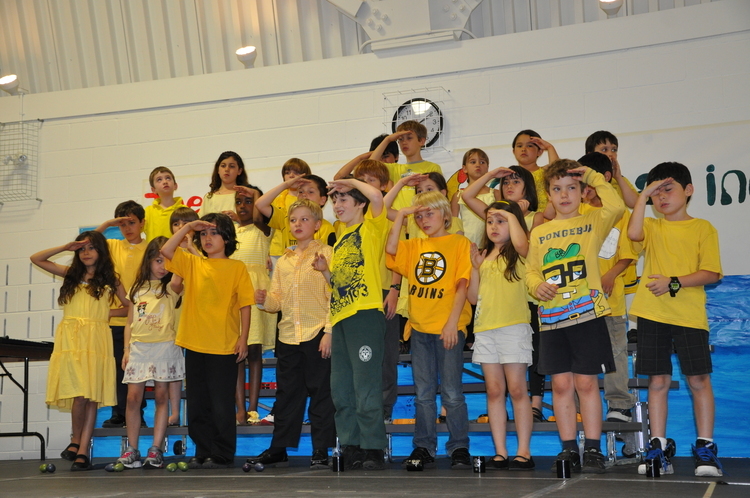 The Priory community joined a lively crew of scallywags and bearded pirates and set sail for a mighty adventure in this year’s spring concert, “Pirates!” The chorus numbers and amusing skits were both entertaining and fun! Many thanks to the Priory's music teacher, Mrs. Campbell, and her Priory pirates for an outstanding performance. Both audience and performers alike were delighted by the comical concert, and the Paré Howlett Hall was filled with laughter and smiles. On Wednesday, June 8, the Paré Howlett Hall was filled with a very enthusiastic audience who were treated to "Music From The Movies”, the theme of this year's Priory Spring Concert. There was a buzz of excitement among parents and relatives as the children performed a varied and colourful program, which also included a movie theme song trivia game. All of the students at The Priory took their turns to play instrumental pieces and sing out the catchy songs from classical movies such as, 'The Sound of Music', 'Mary Poppins', 'Annie', 'The Lion King' and many others, while the School Band played 'Power Rock' songs by Queen and the 'Star Wars Theme' by John Williams. A special thanks to the performers, cast of characters, and their music teacher, Mrs. Campbell, who helped make this concert one of the most memorable yet! A big thank you to Priory Parents for hosting the PPA Spring Bake and Craft Sale, with proceeds from the sale benefiting the Priory School children. SPRING JAZZ CONCERT : A SWINGIN' CELEBRATION! The Paré Howlett Hall was filled with over 200 family members and friends who delighted in an afternoon of pure entertainment. Priory children performed superbly in this year's Spring Concert held on June 3rd, 2015, featuring jazz music and celebrating influential jazz musicians from the 1920's such as Ella Fitzgerald, Billie Holiday, Benny Goodman and Louis Armstrong. The beat of the jazz music was infectious as many family members in the audience found themselves tapping their toes and humming to the melody. Thanks to the senior class, we also learned how much influence jazz has had on the evolution of music since its inception. Many thanks to our music teacher, Mrs. Campbell, for her inspiration and guidance and for elevating Jazz to a whole new level for The Priory community. THE PRIORY COMES ALIVE WITH "OUR SOUND OF MUSIC"
The Austrian hills might be alive with the 'sound of music' and so was The Priory School, when students from Kindergarten through Grade 6 presented their rendition of Rogers and Hammerstein's much-loved musical, "The Sound of Music". Under the direction of music teacher Mr. Davey Lähteenmaa, several grades performed recorder melodies composed by our very own Priory students and presented original songs including, I Am Six and Going On Seven, I Am Seven Going On Eight, Do-Re-Mi, and So Long, Farewell, as well as other famous titles. Many thanks to Mr. Lähteenmaa for his dedication. Music and song and drama all came together on June 8th, as every class at The Priory School contributed to a memorable spring concert. Not content to do what had been done before, they presented "Yellow-ish Submarine", a new version of the colourful Beatles classic. By the end of this story, the people of Pepperland learn that the Blue Meanies aren't mean at all, and that all people have a better chance of getting along if they just talk to each other. While the Grade 6 graduating class delivered the story with humour and personality, the rest of the classes performed a variety of songs by The Beatles, Quebec songwriters and even melodies written by the students themselves. Without a doubt, the songs that were enthusiastically practiced and performed will stay in the hearts of the students and lucky audience for a long time to come. Many thanks to our music teacher, Mr. Lähteenmaa, for his tireless effort, his inspiration, and for bringing "Yellow-ish Submarine" to The Priory.